A property management company installed the spikes to protect its residents' fancy cars. The installation of tree spikes to ward off pooping birds is ruffling feathers in the British city of Bristol. The spikes, which are usually used to prevent pigeons from perching or nesting on building ledges, have been attached to two beech trees by a property management company. The homes are in an affluent neighbourhood and the spikes are meant to protect residents' cars. "Those branches are supposed to have birds singing them, not spikes," Bristol Coun. Paula O'Rourke told As It Happens host Carol Off. Hillcrest Estate Management installed the spikes in 2014, reports the BBC, but they are just now sparking controversy after photos made the rounds on social media. One Twitter user called them a "war on nature," while others suggested residents clean the bird feces from cars using a good old-fashioned sponge and bucket. 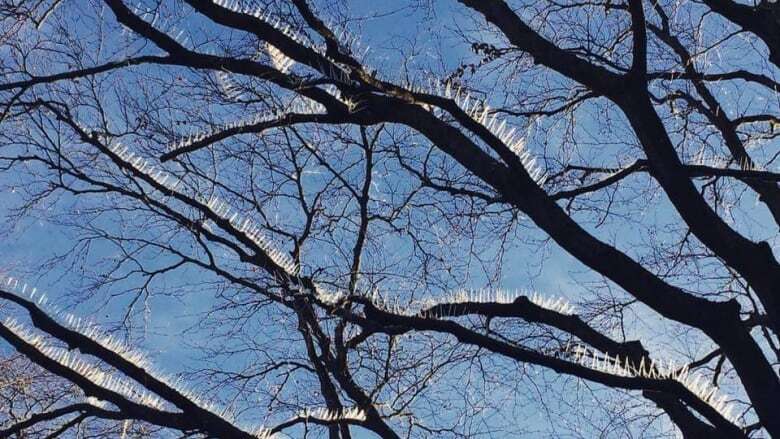 I just learned I live on a planet where humans are putting spikes on tree branches to prevent birds from using them.<br><br>The birds were actually using them first. Hillcrest Estate Management told the BBC they resorted to the spikes after other methods of driving away the birds failed. "Bird detritus can cause permanent damage to the paintwork on cars if not removed promptly and the worst affected leaseholders wanted action taken to try and improve the situation," Hillcrest said in a statement to the British public broadcaster. The company did not respond to As It Happens' request for comment. "There's an assumption by the management company that their cars have more value and they have more right to maintain the cars," O'Rouke said. "Move the cars. Park them somewhere else. Wash the cars. Put a cover on the cars." The councillor visited the Clifton neighbourhood on Monday to personally inspect the spike-lined trees, which she called "sinister." "You're just completely disregarding what could be a beautiful view for people just passing by, ordinary people, people who can't afford to live in those houses," she said. "I think that's unfortunate to have that attitude."